“Bye mom!” He took his sister’s hand and got on the bus. Canteens are notoriously terrible. That doesn’t mean my kids eat terrible food at their school—The French International School of Beijing—and nor is the stereotype of “terrible cafeteria food” fair to apply to every school. This was the first sentence from my son’s lips when he returned from the second day. I gulped again. My kids have been vegetarian since birth. I chose this lifestyle as a youth myself and have been vegetarian for almost thirty years. It’s a big part of my ethics around environmentalism and health and wellness. And, like every parent, I will impose my ethics on my children until they’re old enough to develop their own and make an informed choice. The menu at my kids’ school is diverse and creative but just lacks one thing: vegetarian mains, even as one of two options. The school argues that they have enough in the way of accompanying non-meat options like salads, fruit, dairy, and cooked vegetable portions, but I still worry about my kids’ lunchtime protein intake. And, what’s more, I’m not permitted to supplement plant-based protein snacks for my kids. Another layer worries me: both kids (but particularly my son) are still too young to express their dietary needs clearly—especially in French. Even though I’ve taught my daughter how to say “je ne mange pas la viande,” (I don’t eat meat) I worry she’ll be too shy to say it. And my son’s French is nil. For these reasons, I taped signs to their shirts for the first few days of school that read, in French: I am vegetarian. I wanted to give them another way to communicate. The nurse was sympathetic and assured me they’d received the message. I agreed to stop taping the signs to their shirts. Now I’m just back to holding my breath. “What did you eat at school today?” I ask regularly. “Noodles!” said my son this week. I can only hope there was no beef in the pasta sauce. 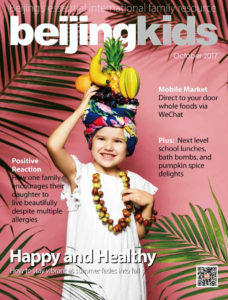 This article originally appeared in beijingkids’ October 2017 issue.